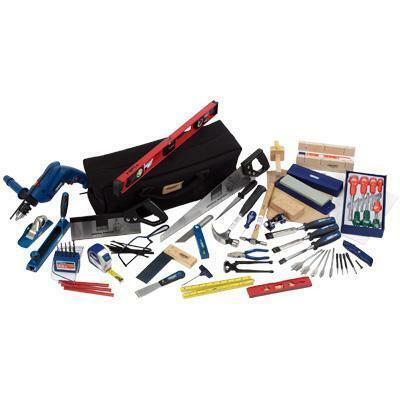 Detailes Maintenance/Carpentry KitA comprehensive range of quality tools for maintenance and carpentry work. Supplied in a large hard wearing canvas holdall. If you are involved with building repairs or work that involves a large proportion of timber, this kit is ideal. As well as a powerful electric drill it also contains such specialist items as a mitre box and mortice gauge. If you are working with wood then you be working with this kit! Claw hammer, twist gimlet, 3 pencils with sharpener, combination pliers, pincers, 8 piece screwdriver set, pin hammer, trimming knife, junior hacksaw with 10 blades, 4 piece cupped nail set, 11 piece combined drill set, 5 piece flat wood bit set, 500mm saw, 255mm tenon saw, 150 mm plasterboard saw, mitre box, 3 piece chisel set, sharpening stone and box, honing guide, block plane, bradawl, multi-rasp plane, chisel knife, mortice gauge, adjustable bevel, try square, countersink bit, hammer drill, 2 spirit levels, measuring tape, folding rule, sanding block, 5 sheets glass paper, tool bag.